There’s nothing worse than seeing someone wearing the same outfit or the same jacket as you when you’re out in public. Or a loved one opening the same gift from you and someone else on Christmas morning. Whether you’re looking for a quirky Christmas gift or two, a vintage number or an outfit with a gothic twist, the independent stores in Manchester can often provide. Why not combine a shopping trip in the city with some evening entertainment and spend the night in this glorious bustling metropolis? There are no shortage of hotels in Manchester, many being centrally located and reasonably priced. Check online to find the perfect deal for you and make use of any advance booking deals to save you some cash. Deviate from the norm and pack the Santa sacks with alternative goodies this year. Whether you are trying to find something a little different for a loved one, or just fancy treating yourself during the festivities as well as everybody else in your life, the multitude of unique shops in the city are definitely worth a visit. This unique, and massive, emporium in the heart of the city centre offers a myriad of alternative and retro stores all under one roof. If you can navigate the labyrinth of stalls on varying levels, you can take full advantage of the treats they have on offer. From tattoo parlours to burlesque attire, memorabilia to vintage clobber; Afflecks has it all. Peruse the 50 independent stores and grab a coffee whilst you’re at the “thorn in the side of the High Street”. With retro and vintage threads being bang on season lately, it’s a perfect time to browse the charity shops and stores that specially cater for the vintage fan. Head to Oldham Street for Retro Rehab where you can be spoilt for choice with their large range of vintage clothing, including customised pieces. Open since 1983, this spectacular vintage store has clothes from the 60s, 70s and 80s waiting for your approval. Fantastically retro, you’ll be transported back in time with the threads on the rails, and bang on fashion if you decide to buy. One of the new kids on the block, you can find Cow in Piccadilly Gardens. Keep your eyes peeled for late night lock ins offering some excellent discounts on their vintage wears. Although still a charity shop staffed by volunteers, this one is slightly different. Specialising in Bohemian and retro fashion and with staff that are hugely passionate about the range, Oxfam Originals offers a great shopping experience. Pick up a one-of-a-kind vintage designer outfit and give this worthwhile charity a helping hand as you do. Hit the shops and enjoy your shopping spree in Manchester. Explore this vibrant city and take full advantage of everything it has to offer. Book a hotel room now to relieve the stresses of getting back home and find the perfect deal for you online today. This entry was posted in Tales Across the World and tagged Manchester, Pop Boutique, Retro Rehab, United Kingdom on October 30, 2012 by srinistuff. I visited this land of the lost… a couple of years ago. That time, it was at the onset of my journey as a travel writer. After two years and many a miles covered on the road, I decided to revisit these ruins to enchant myself, only this time I decided to stay in here longer than I did the last time around. While it was a weekend trip and the entire place could be covered in a couple of days, it isn’t much fun if you don’t let the atmosphere and the beauty of these ruins sink in to you. Doesn’t really make a lot of point if you don’t enjoy the beauty of the Tungabhadra river, maybe take a dip or two in it… Doesn’t really give you peace of mind, unless you perch atop the Matanga hill, the very same hill where Sugreev lived… Besides discovering and rediscovering a lot of things from last time, I felt truly close to the place, especially since I took a good 3 to 4 days of time to explore the village and it’s ruins, while at the same time and here’s what I had to discover. 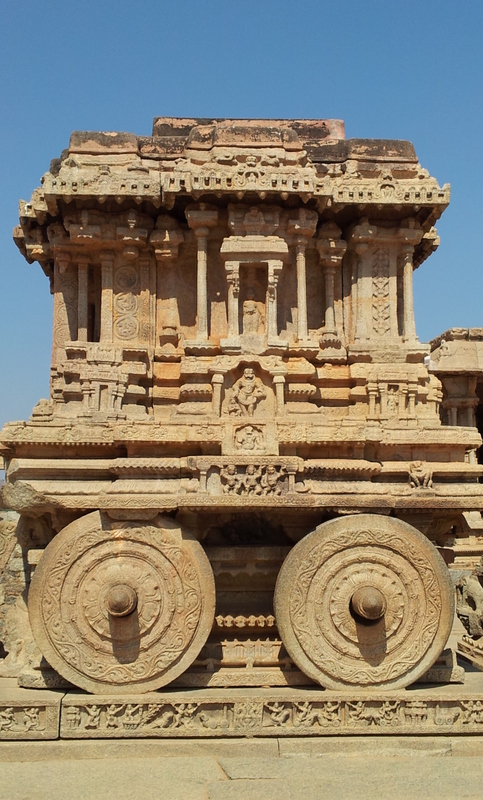 The Stone Chariot at the Vijaya Vittala temple has to be one of everyone’s favorites, certainly is mine. The beautiful construct is a wonder of architecture in itself. 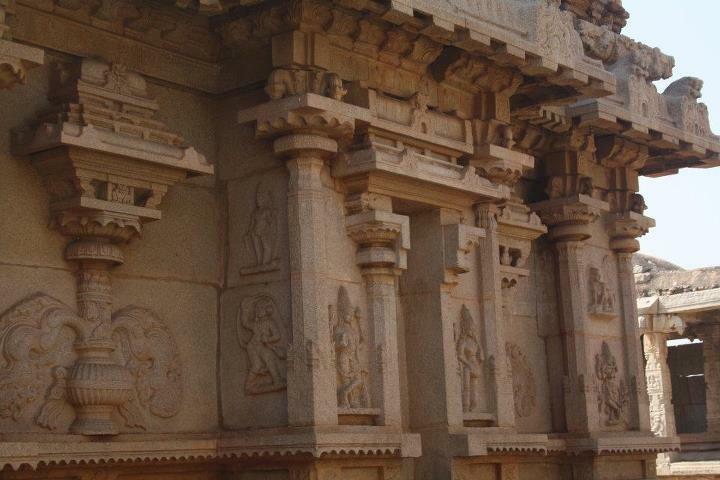 in the Vittala Temple Complex is a shrine built in the form of temple chariot. An image of Garuda was originally enshrined within its sanctum. Garuda, according to the Hindu mythology, is the vehicle of lord Vishnu. It is also a symbol of Karnataka Tourism. This time when I went I saw floodlights have been installed in the temple complex that provide illumination at dusk, thereby adding to the scenic beauty of the architecture. 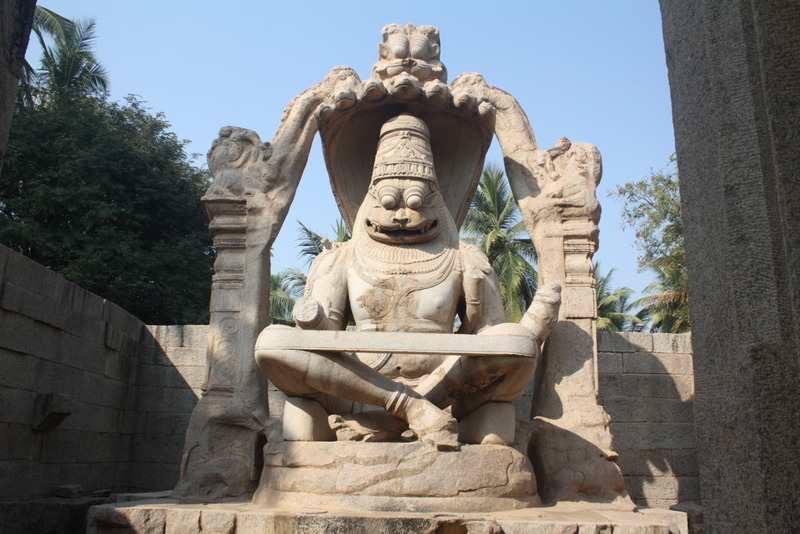 Narasimha in his deadly form, this one is a huge Ugra Narasimha, statue of 6.7 meter height in the south region of the temple complex of Hemkuta group which contains the Virupaksha Temple. Narasimha, being half-man and half-lion, is an incarnation of Lord Vishnu. This gigantic statue is worth seeing. One of the most enchanting things about this statue is that it’s carved out of one rock… Hence it’s part of my top favorites in Hampi. 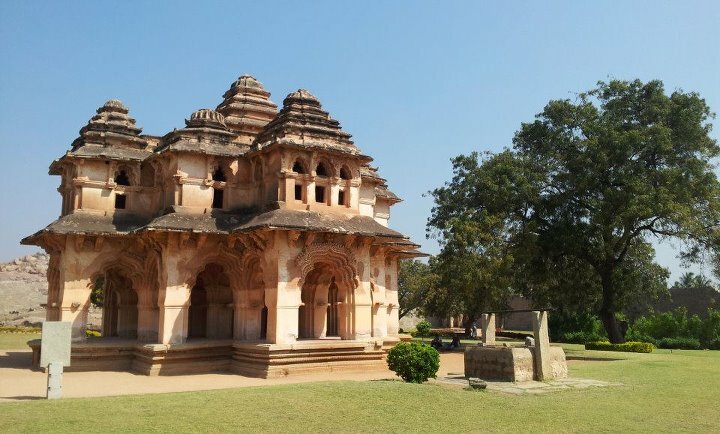 Now this is certainly fascinating, if not in today’s day and age, certainly in the times of the Vijayanagra Empire… This unique architecture is a fascinating modern art haven and scientifically very interesting to explore. 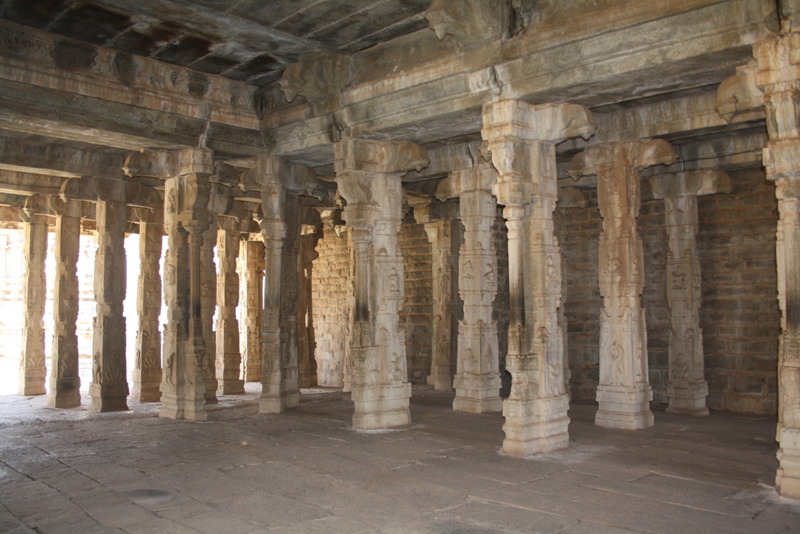 The musical pillars produce a different sound when tapped at the top side, middle (like a bell) and the bottom side of the pillar. If you tap all pillars at same time, they produce a beautiful melodies of musical note. This structure as you walk across the Hampi Bazaar and the police station in the town, you’ll notice, that the more closer you get to it, the more magnificent it gets and when you reach the place where this bull is situated, it’ll make you realize how much grace this statue has within its enchanting eyes. Locally known as Yeduru Basavanna or Nandi, this monolithic bull marks the east end of the Virupaksha Bazaar. The statue is housed in a twin storied pavilion built on an elevated platform. A heap of gigantic boulders behind the pavilion offers an interesting backdrop. Though partially mutilated and carved in a coarse style, this Nandi attracts visitor owing to its giant size. This had to be one of the most beautiful sites for me in those 4 days… I always wondered how the town would look at dusk, more than dawn, the fascination of the ruins around dusk brought an aura a golden enchantment to the fact that these ruins now, mean a lot more than just the beauty and the complex stories and architecture that they brought along with it. It stood for a significant lot of history, a history which cannot be told in this blog alone, a history that one has to go through after reading the UNESCO guidebook of Hampi… But all that apart, just the mere sight of the town across the Matanga hill and the beauty of the sunset engulfing this settlement took my breath away. It was as if, it gave me the reason for its mystic nature and truth to the unexplored was brought out, out from the best of all of us… One must explore Hampi to finally realize what it’s true beauty is all about. This is another really interesting piece of architecture that you would really enjoy… And as usual, feel really insignificant, when you look at the housing for a really huge elephant back in the day. Although, built by the islamic architects in the later part of Hampi’s era, this building is very significant from the way its combined it’s architecture and the whole ensemble fits into the current scheme of things when you look at the ruins. 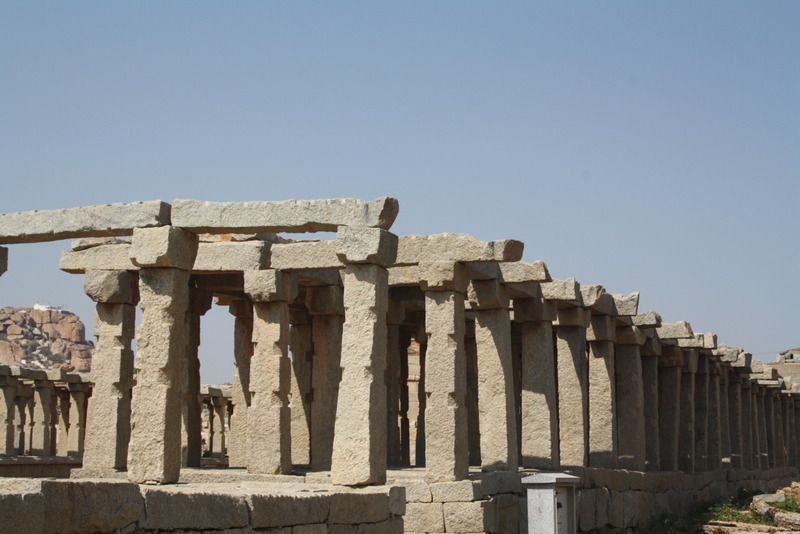 More importantly, it is one among the few least destroyed structures in Hampi and is a major tourist attraction. This long building with a row of domed chambers was used to ‘park’ the royal elephants. Now, this caught my eye, very much, especially because of the interesting architecture and for a reason that it was very cool. I took a look around and decided to investigate why in the scorching heat is this structure cooler from the inside. To my amazement, and of course to a fascination of one kind, I was told by the guide who was around that this was one of the places in the ancient times where queens used to rest and relax, in fact, it had a built in air conditioning system. The structure had in-built terracota pipes and there was a well beside this temple. Water was filled into those pipes and fans were used to circulate the cool air within the palace with drapes around on its gates. One of the most enchanting thing about this temple is its beautiful wall carvings and enchanting structure, even though it’s ruined…The reason it’s called the ‘Hazara Rama’ temple is cause of the fact that the carvings depict comic strips of Hindu mythology, Ramayana in long arrays, on to the walls of this temple. Probably this is the only temple in the capital with its external walls decorated and the temple got its name Hazara Rama (a thousand Rama) Temple because of these Ramayana panels on its walls. Now, one of the things I didn’t hesitate to do this time around, in fact I could thank my hotel owner for this, for he recommended me to cool off by taking a bath in the Tungabhadra river. And believe you me, it was quite a fascinating experience. Be free of yourself, enchanting place that it is, give yourself to the beauty of the river that is part of a lot of places in Karnataka, this was just the experience I wanted to make this trip the most indulging in its own sense. 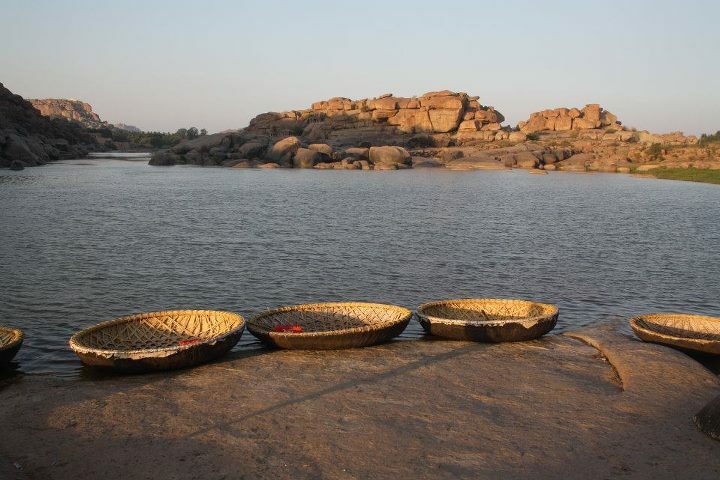 Now the small boats you see are of local fishermen and boatmen, they give you a ride across the river for some 200 bucks to take you to the Anjaneya mountain, one where Lord Hanuman was believed to have lived during the times of Ramayana. 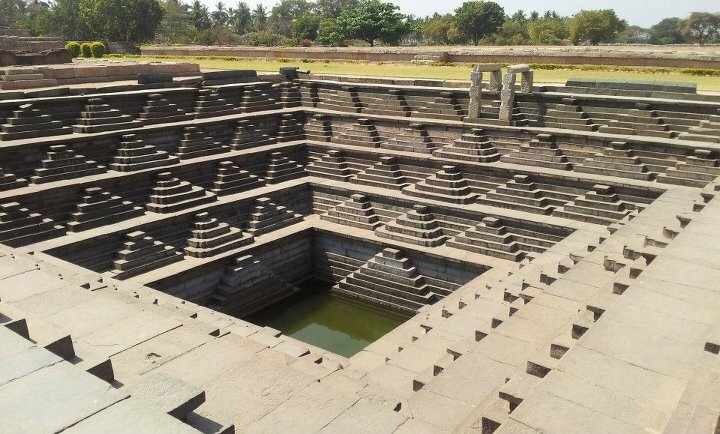 This structure, as the name indicates, is a gigantic bathing area made in the shape of an Octagon. The bath shelter is designed with an octagonal shaped platform at the middle and an encircling pillared veranda around it. The circular section between the veranda and the platform is the water (now empty) area. To the west of it you can spot the ruined bases of numerous palaces. 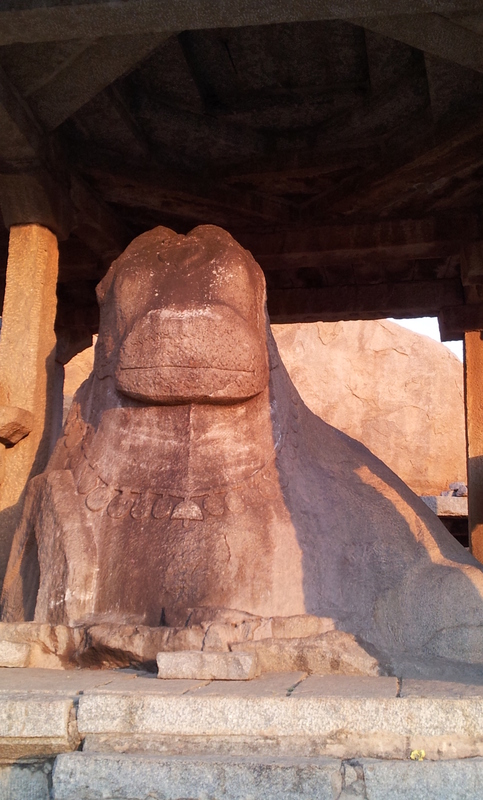 This particular monument and structure would be seen by you as soon as you enter Hampi, that is if you are coming via Hospet by a bus. 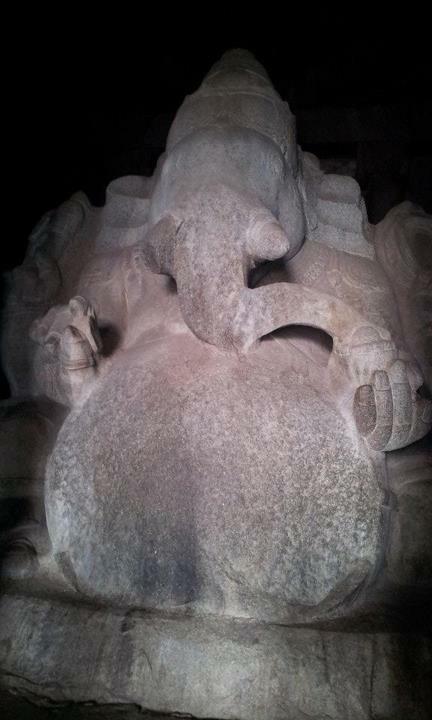 This statue has a Lord Ganesha with a snake tied around its tummy, there’s an interesting story behind it too… In Hindu mythology Lord Ganesha is known for his eating habits. Once he ate so much food that his tummy almost burst. He immediately caught a snake and tied it around his tummy as a belt to save his tummy from bursting. 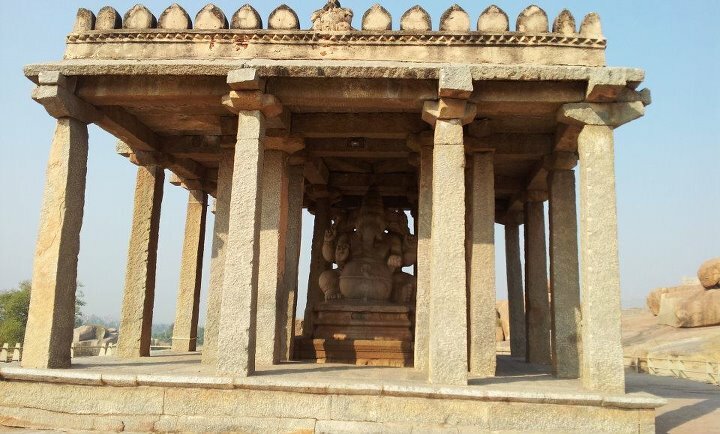 This one is also right around the corner as soon as you enter Hampi… This giant statue of Ganesha was carved out of a huge boulder at the northeastern slope of the Hemakuta hill. The belly of this statue resembles a Bengal gram (Kadalekalu, in local language) and hence the name. Last but not least, this one certainly deserves a mention in my photo essay as it was quite a place to be… On the last day when i was about to leave back to Mumbai, I decided to just sit in the shady complex of this temple, and read a book, The Book of Ram, by Dr. Devdutt Pattanaik. While the experience in itself was great, thanks to the great book, the whole ambiance meant a lot more… The nice cool shade within the complex with the fresh smell of stone and breathing the air of this mystic town was also an added experience. 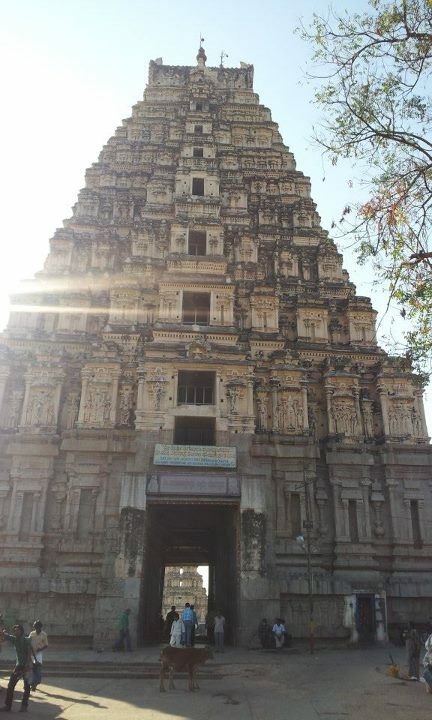 Virupaksha Temple is also known as the Pampapathi temple, it is a Shiva temple in the Hampi Bazaar. 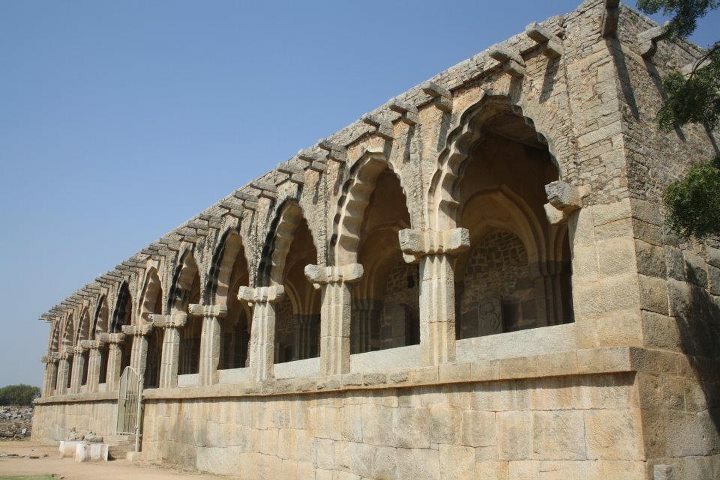 It predates the founding of the Vijayanagar empire. The temple has a 160-foot (49 m) high tower at its entrance. Apart from Shiva, the temple complex also contains shrines of the Hindu goddesses Bhuvaneshwari and Pampa. It also is very significant during the Hampi festival, where a chariot is taken into procession and stands right outside the temple on other days. 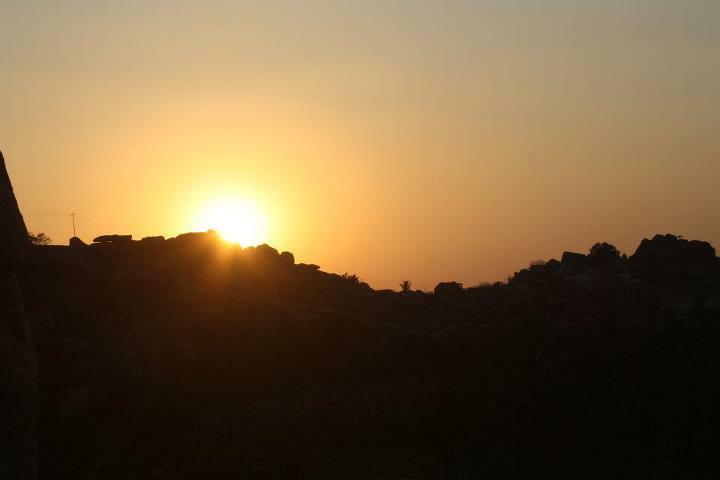 Hampi all in all means a lot to those who are interested in archaeology, mythology, photography and of course travel. But more importantly, for the spectacle of array of beautiful art that it stands for, a culture that it had back in the day and something that we as Indians should still cherish and be happy that we are part of this wonder. Do let me know what you think about this beautiful place and if you have ever been here? 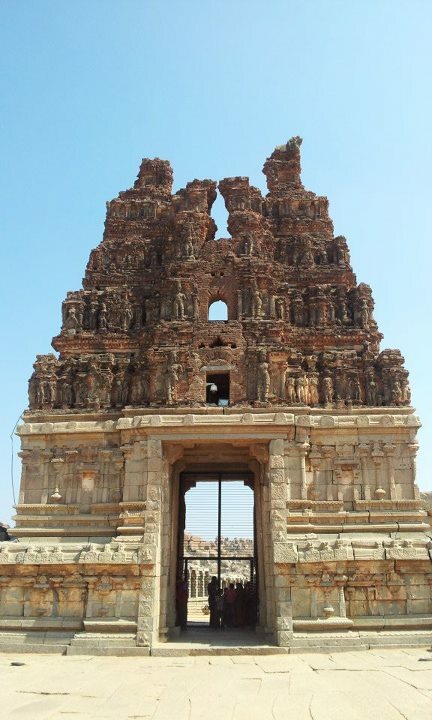 This entry was posted in South and tagged Hampi, Hampi Ruins, India, Kada, Krishnadevaraya, Lord Rama, Matanga Hills, Ramayana, Sasivekalu Ganesha, Sugreev, UNESCO Site, Vijayanagara, Wali, World Heritage Site on October 3, 2012 by srinistuff. He stopped by the river looking up in the sky… He didn’t hesitate to randomly stare at the wilderness around the place! A gentle splash of water on his exerted face… And everything seemed all right! So he had already realized that a lot of distance from the top of the mountain had been covered. He also thought about the parts that were up ahead of this tricky journey, one that hadn’t yet actually started. After many years of trying to understand what connected him to the magic of the mountains and why he kept seeing the beautiful images again and again during the slumber of the night he realized it now… He had always been a fan of the terrain, being an avid mountaineer and generally being fond of exploring Himalayas he knew that this was going to be something he would do for sure. This time around though he had taken a huge break, a break to backpack all the way to the daunting mountains and figure out how far could he go. He already had a history of a lot of ardouous journeys that he had covered up until now. Taking across this long and tiring journey was something he had prepared himself for. 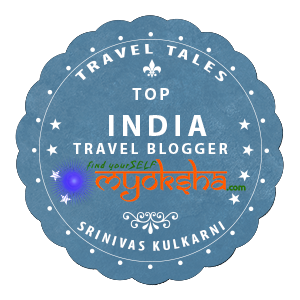 This entry was posted in Travelogues, Stories and Life and tagged Excavations, Explore, Fiction, Himalayas, India, Mountains, Travel, Travel Stories, Travel Writing, Treasure on October 3, 2012 by srinistuff.